Custom Equipment Company offers an extensive selection of bulk boxes that are ideal for a broad range of material handling applications with capacities ranging from 900 to 2,500 pounds. Collapsible Container, Rigid Container, Metal Container, Wire Bulk Basket protect product during picking, assembly, processing, storage and distribution applications with uses in other industries. Containers are available in light-duty, medium-duty and heavy-duty designs to meet a wide range of application requirements. 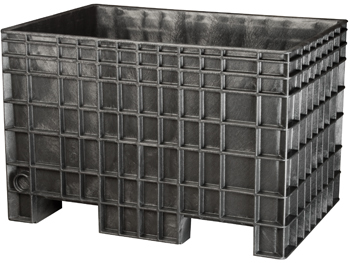 Triple Diamond 32" x 30"
Triple Diamond 48" x 45"
Reusable bulk containers have high strength-to-weight ratios, impact resistance and durability to withstand long-term wear and tear. Collapsible bulk containers with drop-down doors provide easy access and can be folded when not in use. We offer a wide variety of bulk container solutions to move products easily and efficiently through your supply chain.